Life in the city can be more beautiful and democratic using the bicycle. Cyclo-Pouce develops activities with the bicycle as a key element, integrating people with difficult social backgrounds and handicaps. Today, CP is Paris-based. Its main purpose is to improve the wellbeing of people in the city : “La vie est plus belle en vélo”. CP was developed 8 years ago by 16 very different people with bikes as a common passion. The aim was to create an association using bicycles to offer better conditions, especially to people with social/physical difficulties. CP took 4 years to develop, studying existing needs & projects, economic/legal requirements, the right supports and bureaucratic problems.CP finally started in 2000. In an agreement with Paris City Hall (19th), SNCF (French railway company) and CPCU (French urban heating) they were given a space under the “Petite Ceinture” railtrack (abandoned track all round Paris). At the time there was no electricity or water available. CP promotes bikes in Paris, seeing it as a pedagogical instrument, integrating people in the urban fabric in a rewarding way. They employ people who are “unemployable”, with difficult backgrounds such as drug addicts. CP offers all kinds of bike services : deliveries around Paris, originally developed for people with difficulty carrying heavy weights, also for local companies ; bike repair, renewal (donated bikes) and rental. CP tries to adapt to all, regardless of physical capacity. Rental extends to local associations like “Espace 19”, (usually on Wednesdays-when French children have no school. CP also offers mechanics and traffic code courses. They developed a new bicycle in partnership with “Jet Handicap Evasion”, for transporting handicapped people. CP employs people with difficult social backgrounds. In the future, CP would like to establish in other French regions. The Paris site is nice at w/e but can become quite abandoned in the week or on rainy days (weather is a decisive factor in this activity).CP expects to create stronger links with the handicap-related associations like APF (Association des Paralysés de France). A strong relationship with AFP means extending client awareness of special services offered. Meanwhile CP has participated in events like “Championnats du monde d’athhlétisme”, “Descente des Champs-Élysées”, “Défi de l’exploit” and in professional encounters. As it is CP already has a strong organization, there are employees, working schedules, timetables, and a growing number of clients and adherents. But CP has the ambition to grow further and especially amplify their services to the handicapped. This implies a bigger financial investment, a wider promotion attitude, and their dissemination to other Parisian spots. CP space is lent by SNCF & CPCU. They pay 1800 € per 3 months. 4 people work full-time plus 5 volunteers. Workers come from ”Nouveaux emploi, nouveaux service”, supporting unemployable under 30’s. CP earnings pay for material, bikes, water & electricity and rental, plus investing in new models. 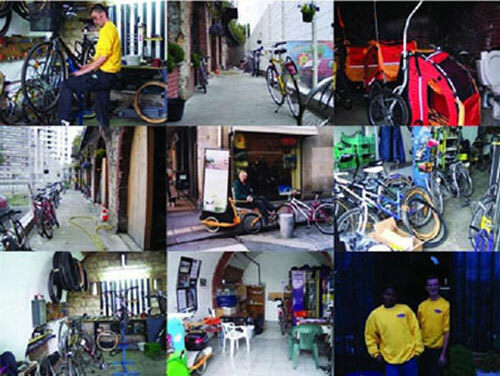 Most profitable activities (bike rental/repairs) support unprofitable services for the handicapped. CP promotes the use of the bike, seeing it as a pedagogical instrument, capable of integrating people in the urban fabric in a more rewarding way. CP develops several activities with schools and social associations, educating and promoting the bike as a complementary way of urban transportation. They employ people with difficult backgrounds, creating new jobs and professionally inserting people, such as drug addicts. With the Hémy-Cyclus, developed with “Jet Handicap Evasion”, they grew their renting service to the handicapped, allowing a handicapped in a wheel chair to move autonomously. CP has obviously a strong connection with the environment, proposing and facilitating a non poluent way of transportation in the city. They recycle old or unused bicycles, by repairing them and making them available to everyone, especially schools and associations. They also have a strong pedagogical sense, promoting the use of the bicycle among the young. The money earned by the CP is used to buy new materials & bicycles, to pay water & electricity bills & the space rental. The most profitable activity to CP is bike rental, the second is bike repair and the third has to do with product selling. In fact, the money earned with the most profitable activities allows CP to offer services to the handicapped people, which is expensive (mainly because the products offered are prototypes developed in the CP workshops).